The giant crab fishery is not discussed in detail as ITQs were only introduced in November 1999 and insufficient time has elapsed to provide meaningful information about the allocation-process and its effects. The ITQs were allocated to eligible fishers on a 50/50 basis, half for holding a permit to fish that was issued by the Commonwealth Government, and half based on the previous catch history. This process resulted in the allocation of 5 quota units to each fisher who held a Commonwealth permit and another 1 quota unit for each 150kg of catch history above a yearly average of 500kg, with a maximum of 35 quota units per licence-holder. The result was that 535 quota units were issued on the basis of holding a permit, and 500 quota units issued on the basis of past catch history. The total allowable catch (TAC) for this fishery is 100t. The rock lobster quota allocation mechanism was set up so that the allocation of the TAC was to be in 10 507 equal units (per pot allocation). However, in recognition of the past high catches by some operators the equal allocation was phased-in over three years. The initial allocation in March 1998 split the TAC 90.909% on a per-pot basis (10,507 units of 130kg), and 9.091% allocated in relation to the the best year's catch out of the previous nine years. In March 1999 the allocation was 94.406% on a per-pot basis (10 507 units of 135kg) and 5.594% on the basis of past catch history. In March 2000 the allocation was 97.902% on a per-pot basis (10 507 units of 140kg) and 2.098% on the basis of past catch history. In March 2001 (and for subsequent years) the allocation was 100% on a per-pot basis (10 507 units of 143kg) and 0% on the basis of past catch history. 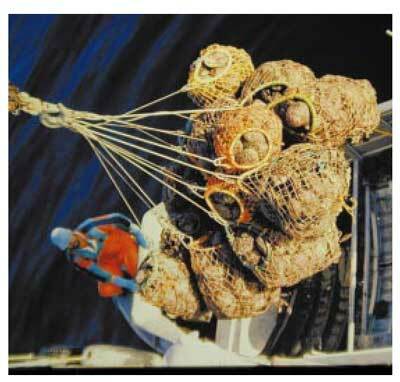 The abalone fishery had individual quotas introduced in January 1985 and the units were allocated to 125 divers. All had an equal allocation, apart from 5 divers who received a lesser allocation but who were later allocated additional units. The initial allocation provided 120 divers with 28 quota units each, and 5 divers with 20 quota units each. Later this became 125 divers with 28 quota units each. In 1993 the quotas became openly transferable and therefore became ITQs. There are 3500 quota units in the fishery and the TAC is currently 2730t. The Tasmanian rock lobster fishery targets the southern rock lobster (Jasus edwardsii) in the waters adjacent to Tasmania. Since 1986 Tasmania has had jurisdiction for the fishery in waters generally south of 39o 12'S, and out to 200 nautical miles from the coastline. This jurisdiction was provided to Tasmania by way of an Offshore Constitutional Settlement agreement with the Commonwealth Government. Prior to 1966 access to commercial rock lobster licences was not limited, but there were limits on the number of rock lobster pots that could be used by each vessel. In 1966 the number of commercial licences was limited to 442 (Harrison 1986a). During the following 30 years there were a number of effort- and licence-reduction strategies that resulted in the number of licences falling to 321 in 1997, with a total limit of 10 507 rock lobster pots. During the early 1980s the fishery continued to expand as fishers moved their fishing operations further offshore. Catches peaked at 2217t in 1985, and then began to decline. This decline in catch occurred despite an increase in effort, which peaked at nearly 2.1 million pot-lifts in 1992. During the period from 1985 to 1992 the fishing effort increased by about 30%, and as the catch was declining the catch-rate began to fall dramatically, as shown in Figure 1. Following the peak catch in 1985, and the subsequent decline despite the increase in effort, the industry and scientists became increasingly concerned about the sustainability of the fishery. Given that the fishery had been exploited since about the 1830s, and the heavy fishing pressure during the 1960s, there was general concern that the stocks were declining. During the early 1990s various management options were explored and debated within the industry, and with government. The Government established a working group to investigate the management options and their suitability for the rock lobster fishery. It was apparent that there were only two options: (a) either a substantial reduction in the fishing effort (of about 30%) or (b), the introduction of a total allowable catch (Anon. 1993). The industry was divided on the issue, with the majority recognising that there needed to be reductions in the catch and effort, but no agreement about how to do it. Finally, in August 1996 the Government decided that the fishery would be managed by output-controls and that individual transferable quotas (ITQs) would be introduced. The Government had two objectives in mind: the first was to reduce the catch to a level that would be sustainable and allow the biomass to rebuild over time. The second was to provide a mechanism whereby the industry could restructure, and allow those who wished to leave the fishery to achieve a reasonable return for their previous access. It was recognised that whatever management option was adopted, reducing the catch would inevitably lead to fewer fishers participating in the fishery, or a less viable industry. The Government believed that quota was the better option for achieving its two objectives, and was supported by a majority of the industry (54% at the time of the decision to introduce ITQs and 67% at the time the legislation was debated by Parliament). Prior to the introduction of quota there were 309 active fishing vessels working in the fishery out of a possible 321 licences. These 309 vessels were operated by fishers who owned and operated a licence, by family operations and lease holders. In January 1997, 188 licences were operated by the owner or by the nominated person if the licence-holder was a company or partnership. Twenty-one licences were operated by a family member of the owner, usually a son, brother, or husband. In some of these cases the operator may have been purchasing the family business. At that stage there were 112 licences that were leased or operated by someone other than the licence owner or the owner's family. It is estimated that there were about 850 people were employed directly on fishing vessels. The value of the 1660t of rock lobster landed in 1997 was just over $A50 million. Economic assessments conducted in 1990/91 and 1997 estimated that on average between 41 - 45% of the landed value of rock lobster, was paid as wages to skippers and deckhands (Morrow 1991, CREA 1997). Typically deckhands are paid about 10% of the gross landed value, depending on their skill and how many deckhands are on the vessel. Skippers may be paid up to 20% of the landed value of the catch, again depending upon experience. The CREA report (1997) found that the material costs amounted to about 24% of the landed value of rock lobster, while Morrow (1991) put the material costs at about 31% of gross landed value. Material costs of 24% equate to about $A12.5 million, and typically include: vessel repairs/maintenance, fuel, bait, insurance, pots, provisions, vehicle expenses, telephone, buoys, rope, travel, accountant's fees, survey fees, licence fees and bank fees. The total fishing costs prior to the introduction of ITQs were in the order of 65 - 76% of the landed value of the catch. Prior to the introduction of quota management, fishers had a fishing licence that allowed them to use a number of pots to take rock lobster. Each licence was issued annually and had attached to it a common law expectation that it would be renewed. The Minister had the power to cancel licences and could exercise that power if a person was convicted of serious offences. The licences were transferable, and additional rock lobster pots could be purchased from a fisher who was leaving the industry, subject to certain constraints related to the total number of rock lobster pots that could be held. In the final year before quota was introduced, fishers were able to own up to 25% more rock lobster pots than they could use on their vessel, to allow the restructuring process to begin. The nature of the fishing right was such that fishers did not have access to any given share of the resource, so, essentially they used their licence to fish as hard and fast as they could, in order to catch their perceived "share" before someone else caught it. Thus, there was little incentive for individuals to fish sustainably as someone else would catch the fish if they did not. However, some fishers only fished as long as they needed to make a reasonable living. It was this problem that led to the increased fishing effort and hence the decline in the stock. Changes in the management regime were required to ensure that the resource was fished sustainably and in an economically viable way. 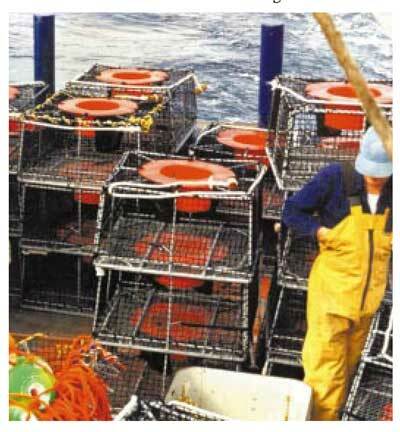 The unit of access to the fishery was the number of rock lobster pots held on the licence. Licences traded on the basis of the number of pots attached to the licence, regardless of the historical catch associated with the licence. In 1993 licences were trading for about $A4000 per pot, increasing to around $A10 000 in late 1997. The rock lobster quota units were allocated in perpetuity to the people who held commercial rock lobster licences by means of legislation (the Living Marine Resources Management Act 1995). The initial allocation included partial recognition of past catch history with 9% of the total allowable commercial catch (TACC) being allocated on that basis in 1998, phasing out in 2001. Then each quota unit will provide exclusive access to take 1/10507 of the TACC of 1500t. The licence is an annual licence which must be renewed by the Minister as long as (a) the licence fee is paid, and (b) the person has not been convicted of a relevant offence under the law of another State, Territory or the Commonwealth. If the licence renewal is refused under (b) the licence-holder has a right of appeal to an independent appeal tribunal. Case history suggests that the refusal to renew a rock lobster licence on these grounds would require a serious offence in a rock lobster fishery. Therefore, this provision cannot be used for minor breaches of other fisheries laws. The Act provides that only the fishing licence is forfeited if 200 demerit points2 ($A20 000 in fines) are reached in any five year period; the rock lobster quota units are not forfeited. As the greatest asset value lies with the quota units, the licence-holder's investment is protected from forfeiture. While any licence-holder convicted of an offence that resulted in demerit points would be excluded from holding a licence for 5 years, they would be able to sell or transfer their quota units, thereby retaining the asset value of the quota. Any licence-holder who leased the licence to another fisher would not be prevented from buying another licence and transfering the quota units to it. The Act requires the holders of commercial fishing licences to be allocated the rock lobster quota, regardless of the instrument that creates the licence. This means that a new licence-type cannot be created to transfer the ownership of the quota units to a new group of licence-holders. The above three characteristics effectively mean that the rock lobster quota units and rock lobster licences are issued to the licence-holders in perpetuity, and they cannot be made to forfeit the asset value if convicted under State law. Rock lobster quota units can be freely transferred between the 316 licence-holders on a permanent or seasonal leasing basis. Only licence- holders may own quota units, this means the maximum number of unit holders recognised by the Government is 316. This will be one of the issues for the future, in that there are already a number of licence-holders who believe that the ownership of quota should be separate from the fishing entitlement. Currently the majority of licence-holders want ownership of quota to remain with the fishing licence. This issue is further compounded as the industry has sought to have legislation introduced so as to allow financiers to register financial interests in licences and quota units. Already it is apparent that there are a number of licence-holders with investor partners who have funded the purchase of additional quota units and this trend may continue, thus there will be increasing pressure to allow these investor partners to be formally recognised (Ford 2000). The Government decided in August 1996 that it would introduce ITQs into the fishery. This decision was taken after three and half years of intense debate following the release of the Working Group's interim report in March 1993 (Anon. 1993). This report recommended two management options: one being the introduction of ITQs, and the other being a 15% pot-reduction followed by ITQs or a further 15% pot reduction. The industry was fairly evenly divided over the issue, with a slight majority favouring quota. During this period there were a number of discussion papers released on how ITQs could be implemented, two formal industry ballots (both resulting in a small majority for quota), many industry meetings and much political lobbying. Between the time when the Government announced its decision in 1996 and the Parliament finally approved the ITQ legislation, there was intense political lobbying by the supporters of quota and those opposed to it. The lobbying from those opposed to ITQs resulted in a Select Committee being established by the Upper House of the Parliament, which set out to review the management of the fishery and consider future options. The Select Committee report was handed down in July 1997 (Schulze et al. 1997) and contained 18 conclusions. One of which concerned the difficulty of determining an equitable formula to transfer management from the established pot-allocations to ITQs. The report made nine recommendations, two key ones were: that ITQs not be introduced until the industry had been rationalised substantially through input-controls, and that if ITQs were ultimately introduced, they be phased-in. The Government rejected the findings of this report on a number of grounds, but one of the key concerns was that rationalisation by further input-controls would not achieve sustainability in the short-term. Subsequently, the Government proceeded with developing the ITQ system and an appropriate allocation method. The Government had three objectives in mind when it set about allocating the quota. The first was that the access rights be maintained, and that one should preserve the 30-year history of the value of the licence being tied to the number of pots on it. The second objective was that the allocation method needed to be secure from legal challenge. The third objective was that the method needed to be simple to implement, without substantial administrative work being required. Concern about the allocation method was the key reason why many people either supported or opposed ITQs. There were two opposing views held by many in the industry. One view was that the allocation method should only recognise the ownership of pots, as this was the tradeable access right. The other view was that the majority of the allocation should be based on past catches of lobsters so that those with the highest catches would receive the greatest allocation. A number of methods using a combination of pot- ownership and catch-history were also devised but received little support. The Government supported the view that allocation should be based solely on pot- ownership, recognising that this was the long accepted unit of access and each person's access right was the number of rock lobster pots on their licence. The Government was also concerned that catch history only recognised a fisher's activity over a short period of time and that fishers who had high catches in the past may have reduced their effort in more recent years. The Minister established a Fisheries Advisory Committee to advise him on managing the fishery under ITQs and to assist the Department to draft a management plan. This Committee was not asked to consider any alternative allocation mechanisms, but did seek submissions from the industry on allocation arrangements, and generally supported the Government's proposed allocation method because the majority of industry supported the equal-pot allocation method. During the entire period of trying to develop new management arrangements, the Government was well supported by the main rock lobster industry group, the Tasmanian Rock Lobster Fishermen's Association (TRLFA). The TRLFA worked with the Department and the Minister to try to get support for the restructuring proposals, however it was somewhat constrained early on because its members were unable to give it a clear direction to pursue. However, in 1995 a majority of the membership supported the introduction of ITQs and requested the Executive to participate in developing detailed proposals. This outcome resulted in a breakaway minority industry group forming to try to ensure that ITQs were not introduced. The Government released a draft management plan for the fishery in June 1997 and the allocation method proposed was to allocate one quota unit for each pot held on a licence, which would result in a quota unit equalling 1/10 507th of the TACC. The Government had previously decided that the ITQ system would be supported by legislation to minimise any opportunity for legal challenge. This meant that the allocation mechanism would be enshrined in legislation. Tasmania's Upper House (Legislative Council) was not controlled by the Government, and had before it the Select Committee report (Schulze et al 1997) recommending against quota management. The Government, with the support of both Opposition parties, got unanimous support in the Lower House for the proposed system, which passed the Bill containing the equal allocation mechanism. The intense industry lobbying resulted in a long and, at times, heated debate when the legislation was presented to the Upper House for its consideration. The supporters of quota presented a petition signed by 67% of the licence-holders, and both sides of the industry were invited to make detailed presentations to the Legislative Councillors. Every one of the 18 voting members spoke on the issue and it became clear that the Bill could fail unless the allocation mechanism was amended to include at least some recognition of past catch history (Hansard 1997). The Government accepted this position and the Bill was redrafted with the assistance of one of the independent members the Upper House who agreed to vote for the Bill with such amendments. The allocation method finally passed by Parliament (Statute No. 56 of 1997) set up two allocation schedules, one for the allocation of quota in relation to the number of pots, and the other for the allocation in relation to past catch history. The catch history component of the allocation was designed to be phased out by the end of the third year of the quota system. The split of the total allowable commercial catch (TACC) is shown in Table 1. The catch history period was set as the sum of best three years from the period November 1988 to October 1997. The allocation method for the catch history component was calculated using Formulas 1 and 2 (see below). These formulas allocated to each licence-holder a single quota unit with a differing kilogram value depending on their catch history. A rock lobster catch history that was negative was taken to be zero. 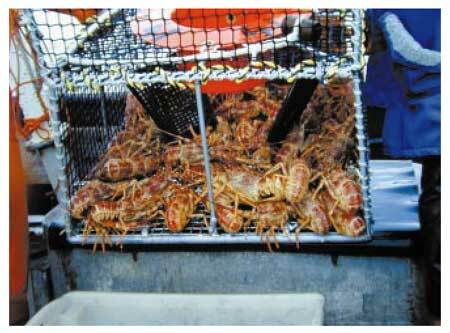 The rock lobster catch history (RLCH) was the sum of the best three yearly catch histories. The allocation-process issued each licence-holder a share of the quota provided to the catch history part of the TACC, calculated as a percentage of the sum of the rock lobster catch history for all 316 licence-holders. Formula 1 was used to calculate the catch history above the per pot allocation of 130kg for each licence-holder for each year, and Formula 2 was used to determine the value of their rock lobster catch history unit. The resulting allocation of quota is shown in Figure 2, the actual quota allocation is compared against the proposed equal allocation method to show the effect that the amendments had on the licence-holders. YC = yearly catch of rock lobster for that year in kilograms. TACCch = part of the TACC set aside for the catch history allocation, see Table 1. The allocation method required each licence-holder's number of rock lobster pots and their rock lobster catch history since November 1988 to be quantified. The licensing and the catch history information were both contained within the Department's rock lobster catch-and-effort system (CRAYBASE), however the information stored could not be extracted in a form that allowed each licence-holder's catch history to be determined. The reason for this was that the primary code for linking data was by vessel or licence number, and not by licence-holder. As the licence-holders often changed licences and vessels, the task of extracting the data needed to be coded into the database. This problem was compounded because a number of licence-holders were, in fact, the same entity and effectively able to claim a pooled catch history, so all the licence-holders had to be able to be linked to all the other licence-holders. The legislation for the allocation method did not deal with such issues, so they were decided upon by Ministerial Guideline, in accordance with the Living Marine Resources Management Act 1995. The Department had begun to consider these matters some years before, when allocation mechanisms were being discussed and it conducted a thorough data-quality checking process which took six months. This process enabled the allocation to be done with high quality data. Once the reporting tools were written to allow the catch history to be calculated, further data-checking was undertaken. This process took an additional two months. During the process of amending the allocation Bill, it was recognised that, while the catch data was held on the database as submitted, it may not have reflected the true catches, due to under- or over-reporting of catches. Therefore, to remove any debate over what was actually caught, the legislation established that the catch history was to be based on the catch returns held by the Department. This removed the need to verify the majority of the claims for catch history. Licence-holders were provided with a summary of their reported catch history. The quota legislation established an appeal mechanism whereby the licence-holders could seek to have their rock lobster catch history reviewed on the basis of one of the following: (a) an error in data entry; (b) a mistake existing in the licensing data; or (c) a vessel or an associated licence-holder had been omitted from their catch history. Each licence-holder was provided with a yearly summary, their licensing records, and the value of the rock lobster catch history they were to be assigned, together with an application form to have their catch history reviewed. They had 30 days to lodge an application for review. The review process was undertaken by departmental staff and each review application was considered by the Secretary of the Department. This review process was then appealable to an independent Appeal Tribunal. There were 18 applications for review, the stated reasons included: data entry errors; omitted licences; the opposition to the allocation mechanism; leasing arrangements; wrongly assigned catch history; missing vessels; and incorrect number of pots. Of these, 4 review applications were successful and 14 were dismissed. Four of these unsuccessful reviews were taken to the Appeal Tribunal where two were conceded on legal grounds, one was resolved by mediation in favour of the appellant, and one appeal was heard and rejected. The allocation and review process was conducted by staff of the Department, the determination of each licence-holder's catch history was achieved in two months using three staff. The four appeals lodged with the Appeals Tribunal were prepared by a lawyer within the Government's Office of the Director of Public Prosecutions. The allocation, review and appeal processes were conducted within the Department's existing budget, however the task required the re-assignment of two staff for the much of period. The introduction of the ITQs using the allocation mechanism described has been highly successful and has resulted in significant industry restructuring, and an increase in the biomass and egg production levels in the fishery. The industry restructuring objective recognised that the fishery was overcapitalised with too many vessels and there were too many fishers in the fishery. The allocation mechanism was designed in such a way that fishers could sell off their allocated quota and leave the fishery, but still get a good return on their investment even if they had not been catching large amounts of rock lobster. Many older licence-holders took the opportunity to retire and sold their licences and quota, receiving up to $A20 000 per quota unit. The value of the access rights have doubled since quota were introduced, from $A10 000 per rock lobster pot in late 1997 to the present value of $A20 000 per unit. However, a detriment to the ITQs system and the allocation mechanism, has been the loss of employment for up to 60 lease-holder skippers and their deckhands. Unfortunately many of these fishers have been unable to continue to lease licences, because the licence they fished was owned by another fisher who now required the additional quota. Regardless of the restructuring option implemented, it would have resulted in a smaller fleet and these people would still have been the first to leave the fishery. These fishers received none of the rewards of being able to sell quota, and invest the monies in other businesses or retirement. The sustainability objective is being achieved much faster than was anticipated, with an estimated 11% increase in statewide lobster biomass, a 5% increase in catch-rates statewide, and increased egg production by rock lobsters in the northern part of the State after only one year. However, there is some regional variation, with some minor declines in some areas (Gardner 1999). The objectives related to the allocation mechanism were largely met, despite the proposed allocation method being amended by the Parliament. The process for determining each allocation and issuing licences ran very smoothly and was completed within seven months. The equal-allocation component was finalised and completed in three months, with the final catch history appeals being resolved four months later. The legislation was passed in November 1997 and the quota system began on 1 March 1998, with licence-holders able to commence fishing on their pot-based quota units. The legislation has been robust enough to deter any legal challenge. The objective of recognising the importance of the past access-rights and preserving their value has been achieved. As a result those who have sold their licences have made substantial gains. The introduction of the ITQs was an extremely contentious issue that divided the industry, local fishing ports, friends and families. The intensity and acrimonious nature of the debate took its toll of all concerned. The level of animosity increased over the period from 1993 to the end of 1997 as each side in the debate believed their arguments were right and the other's wrong. Some fishers took the view that they would take every possible step to ensure ITQs were not implemented. The debate became intensely political. The move to ITQs in the fishery was strongly influenced by a few politicians on both sides of Parliament. The entire process was conducted across the period of three successive governments and was handled by four successive Ministers. This lengthy timeframe concerned many and there were increasing concerns that any meaningful decision would be too hard for the government to make. The level of support for quota management was just over 50% in 1993 and remained at this level until the months preceding the legislation being tabled in Parliament, when there was a dramatic increase in support resulting in a petition being presented signed by 67% of the licence-holders. Importantly, this support was from a range of fishers with both low and high catch histories. However, it is important to recognise that support or opposition for the system was based on the allocation method and process, rather than the concept of quota management. The amendments to the allocation mechanism went some way to appease the licence-holders with large catch histories who were being disadvantaged. The process of determining the catch histories in making the quota allocation was generally well received by the licence-holders, as they could see that the review process and appeal process provided avenues to sort out genuine problems in determining catch history. Two years after the introduction of the quota system the vast majority of fishers are now satisfied with the system and are seeing benefits from it. However, there are still a few fishers opposed to the system. The industry is beginning to put the allocation-process behind it and the opposing factions are starting to come together, however, this process will take some years as the divisions in the industry were deep. The process of bringing the industry together has largely been about establishing trust and re-establishing working relationships. There are many in the industry who believe that the quota system has resulted in significant benefits by allowing them to take more control of their fishing operations and choose the time and weather when they fish. Many of the higher catchers are also satisfied with the system, even though they have had to buy additional quota. The recreational fishing community and the conservation groups are two stakeholder groups who have an interest in the sustainable management of the rock lobster fishery, both are supportive of ITQs. The recreational fishing community see the direct benefits of a sustainable fishery as being improved catch-rates where the stock is being rebuilt. The conservation lobby is supportive of ITQs as they directly limit the catch. Some of the coastal communities who are concerned about regional employment and the effects of rationalising industries (like the fishing industry) expressed concern during the development of ITQs. However, their input or criticism was largely driven by the views of the fishers in their local community. The restructuring of the rock lobster fishery has been very successful, however there have been a number of social costs associated with fishers having to leave the fishery and the deep divisions that were generated within industry. One of the significant factors which worked against a smoother development phase was the length of time taken between the Working Group releasing its two management options in March 1993, the decision to introduce ITQs in August 1996, and the finalisation of the legislation in November 1997. This lengthy period resulted in the industry becoming more divided and polarised. The time-frame was set through the political process, and there was little that the industry could do to speed up the political decision-making process. The political reality resulted in a lengthy process of gathering information, discussing options and trying to convince the industry to support ITQs. One of the key issues associated with the introduction of ITQs was the concern that the allocation method would redistribute the wealth in the fishery. This argument can be, and was, used by those supporting the equal allocation method and those supporting recognition of past catches. The difficulty with the argument lies in how the wealth of the fishery is perceived. Some believed the wealth of the fishery was tied solely to the existing access rights, while others believed the wealth of the fishery was related to the amount of rock lobster a fisher caught. So the argument about wealth redistribution was used by both sides to convince the politicians that the allocation mechanism was either fair or not. This only acted to complicate the political process. One of the lessons to be learnt from the allocation-process is that there needs to be some degree of balance in the chosen allocation mechanisms, rather than favouring either end of the spectrum of views. Even though the final allocation mechanism took into account both the long-standing tradeable access right, and the fishers' past catch history, it got no support from the industry when it was first proposed. However, when the allocation mechanism legislation was debated in Parliament, the political process sought such a compromise mechanism. If the industry had been prepared to push for such an allocation mechanism it may have found there was less political interest, and ITQs might have been introduced in mid-1997 or earlier. In fact, if the industry had been prepared to accept such a compromise allocation method, the decision to move to ITQs may have come in late 1994 and the system may have been able to commence in 1996. There may be a lesson for industry in that holding out for an allocation method that results in big winners and big losers, inevitably means the issue becomes politically sensitive and lengthy delays can be the result, often producing a compromise that could have been reached by the industry itself. reefs and are most abundant along the north coast and around the Bass Strait islands. Blacklip abalone occur on rocky reefs in both exposed and sheltered waters. Their distribution is variable but less patchy than greenlip abalone (McNee 1993a, 1993b). Prior to 1963 the Tasmanian abalone stocks were not significantly fished. For the past 7500 years at least, Tasmanian Aborigines have been harvesting abalone (Jones 1971). During the nineteenth century there was minor exploitation by Chinese immigrants. In the 1950s a small-scale fishery was attempted but was not a commercial success. By 1963, however, modern diving equipment and the identification of Asian markets provided the basis of the modern fishery (Harrison 1983, 1986b). Catches rose rapidly from 1963 to 1971, then went through a cycle of decline and recovery between 1972 and 1977 (see Figure 3). From a low of 1450t in 1978, the fishery expanded to a maximum of 4500t in 1984. The abalone catch in 1984 from Tasmania was approximately 22% of the world abalone catch (Harrison 1986b). A minimum-size limit was the first management measure imposed on the fishery. This was followed in 1965 by the introduction of a licence for commercial divers with a requirement for monthly catch returns. Abalone had to be landed alive, thereby preventing processing at sea, to assist with the enforcement of the new size-limit restrictions. The number of diving licences were limited to the 120 licences that were current in 1969, so as to prevent excessive fishing. In 1972 to encourage the exploitation of the abalone resources around the islands of the Furneaux Group (off the north east of Tasmania), five special abalone licences where issued exclusively for the use of residents of the Furneaux Group. These special licensees were restricted to operating around the Furneaux Group. The 120 other "mainland licences" were prevented from diving around the Furneaux Group. Between 1972 and 1985, additional changes were made to the regulations governing the commercial abalone fishery, mainly involving progressive increases in the size of penalties. Also during this time several changes were made in how a commercial abalone diver's licence could be transferred. Under the Fisheries Act 1959, personal licences i.e. a licence that authorised the holder to personally go fishing) could not be transferred, thus several pseudo-transfer methods were developed for the commercial abalone diver's licence. Initially, a diver if retiring from the fishery due to health reasons, could nominate his replacement. This was subsequently withdrawn and replaced with an unofficial system whereby a diver who retires for any reason could nominate his replacement. During the early 1980s abalone divers approached the government expressing concern regarding potential overfishing of Tasmania's abalone resource. The industry and Government decided to implement a quota system of management from 1985 onwards. During 1984, the industry and the Government agreed to introduce a total allowable catch (TAC) for the commercial abalone fishery. It was to be divided into 3500 equal quota units and each diver was to have had an equal share of the units. Thus the 125 divers were to have 28 units each. The proposed total allowable catch was to be 3500t or one tonne per abalone quota unit. The abalone fishery was still divided into two parts, the mainland of Tasmania with 120 divers and the Furneaux Group with five divers. When the potential annual catch for the five Furneaux divers of 140t was compared with the long-term average catch for the area, it was found to be 40t greater. To keep the new catch level within the long-term average it was agreed to decrease the allocation to the five Furneaux divers to only 20 units each. In 1985 a total allowable catch of 3806t and a system of individual quotas (IQs) were introduced, being 3460 quota units at 1.1t each. Each mainland diver was allocated 28 abalone quota units of which up to 12 units could be transferred to another diver for the season, thereby allowing for limited transferability of the quota. The Furneaux Group divers received 20 quota units but they could only seasonally transfer their quota to other Furneaux Group divers. Industry and Government continued to have concerns that overfishing might be occurring and in the four seasons from 1986 to 1989 they agreed to a series of reductions in the total allowable catch down to 2076t (Figure 3). 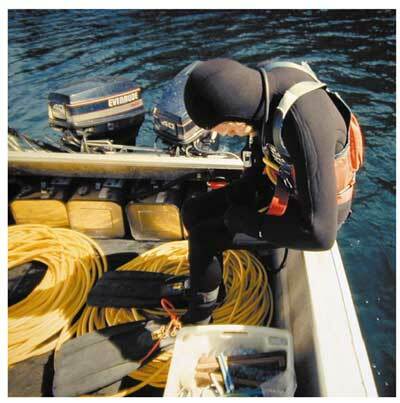 The Tasmanian commercial abalone fishery was made a single fishery in 1990 when the division between the mainland divers and the Furneaux Group divers was removed. To put the five Furneaux divers on an equal basis with the mainland divers, the Furneaux divers where each granted an additional eight quota units to bring their level of access to 28 quota units. The 40 extra quota units brought the total allowable catch up to 2100t, where it remained until 1997 when there was a 20% increase to 2520t. In 1990, after pressure from the abalone industry, the Government conducted a review of the abalone licensing system (DPI 1990). A commercial abalone licence was then worth about $A1 000 000, which meant that, without financial backing, it was beyond the means of most people to enter the fishery. Most formal financial institutions would not lend such money, when a commercial abalone licence was the sole, or main, collateral. As a result of the review, from the beginning of the 1991 quota year (which ran from 1 January to 31 December 1991) the commercial abalone licence was divided into two licences: authority to dive for abalone, and to hold abalone quota units. This system was a reflection of the changes that had already occurred in the Tasmanian commercial abalone fishery where increasing numbers of divers were leasing their licences off former divers, processors or other financiers. The splitting of the entitlement allowed those arrangements to be officially recognised. Only the holder of a commercial abalone diving licence could dive from a fishing vessel to take abalone for commercial purposes. A diver needed to be authorised by the holder of an abalone quota unit to take the abalone which the abalone quota unit represented. Holders of abalone quota units did not need to be commercial abalone divers and the number of units that could be held by an individual or company was unrestricted, in terms of both minimum and maximum holdings. Many of the commercial abalone divers owned all or part of the 28 abalone quota units originally attached to the licence. Figure 4 shows the average beach price for each three months since the beginning of 1990. During the early 1990s whilst the catches were stable (see Figure 3) the value of the fishery began to increase, reaching a peak in 1993 (beach prices reached $A55/kg during October and November of that year). During 1993 the Fisheries Act 1959 was amended to allow for the transfer of personal licences such as commercial abalone diving and abalone quota licences. Thus the management arrangements for the commercial abalone fishery could be called an individual transferable quota (ITQ) system. In 1994, contracts (called Abalone Deed of Agreement) were introduced that increased the level of security for quota holders and their financial backers, whilst potentially increasing the return paid to the Tasmanian Government. These Deeds also provided a high level of financial and operational security. Over 95% of quota units are under such Deeds of Agreement, with the remaining units being under annual licences. The Deed is for ten years with an right of renewal, thus the Deeds are essentially for perpetuity. In 1994, there was a decline in the beach price back to 1992 levels (Figure 4). During 1995, the beach price continued to fall, with some individual beach prices reaching as low as $A18/kg. There has been an improvement in the beach price during late 1995 and 1996 through to late 1999. The nature of fishing rights in the Tasmanian commercial abalone fishery has undergone several changes since the introduction of licences in 1965. There are two main phases, prior to 1985 and afterwards. The nature of the rights since 1985 have undergone three changes with the introduction of separate licences for diving and the quota, then transferability for both licences, and thirdly the introduction of the abalone Deed of Agreement. The commercial abalone diver's licence was an annual licence that authorised the holder to take, for sale, an unlimited quantity of legal size abalone from Tasmanian waters. There was no "official" right of transfer and there was no legislative basis for renewal. The Fisheries Act 1959, and its subordinate regulations, only referred to issuing such licences. The licences were subject to ministerial powers to revoke a licence if the holder committed a serious offence. There was, however, a common law expectation of renewal so that unless the holder had committed a serious breach of the regulations or the management arrangements had been changed, the holder would have his licence reissued. It should be noted that only once did a Minister remove a licence from a holder. In 1985, a commercial abalone licence for a mainland diver comprised the right to 28 units of quota and the right to dive to take these abalone. The abalone quota units each provided a right to 1/3500th of the total allowable catch. At the beginning of each year a diver was issued his licence and 28 units of quota. Each diver was required to take at least 16 units and was allowed to temporally transfer up to 12 units. Thus it was an individual quota system without transferability. The introduction of an individual quota system did not alter the basic nature of the commercial abalone licences. It retained the common law expectation of re-issue and they could be terminated by ministerial direction for serious breaches of the regulations. In 1991 the nature of the commercial abalone licence was significantly altered when it was separated into two entitlements, the authority to dive for the abalone, and a share of the abalone total allowable catch through abalone quota units. Both entitlements were in the form of two new annual licences. Again both new licences maintained the central features of the earlier commercial abalone licence, as outlined above. In 1993, both the diving and quota licences became transferable. Since the transfer of abalone licences was now formalised, they come under the powers of the Minister to refuse a transfer. The grounds under which the Minister could take such action included the circumstance where the current or future holder was facing serious charges or had been convicted of such. This increased the degree of property right by formalising the trade in both licences. The most significant alteration in the nature of the rights of the abalone quota licence occurred in 1994 with the introduction of the Abalone Deed of Agreement. This contract provided holders of rights under a Deed (that is people who hold abalone quota units under a Deed) with the right to take from State waters abalone that are above the legal minimum size to the amount of 1/3500th of the total allowable catch for every quota unit held by those people. The Deed allowed for the transfer of all or some of the rights under a deed in accordance with Tasmanian contract law. The Deed moved the control of such transfer from the Minister to the holders of the rights. However, the Secretary retained the right to say whether or not the potential holder was a "fit and proper person". the holder entering into an arrangement with a diver for the diver to pay the royalty. For the first and third reasons, the deed stated that if the holder of rights under a deed corrected the matter at hand, then the rights could not be terminated. That is, if the holder later paid the royalties or terminated the agreement with a diver, then there were no longer any grounds for the termination of the rights under a deed. Such an option is not available for offences against the abalone fishery, however, in such a case the holder could sell his or her rights, rather than having them terminated. The amendment to the Fisheries Act 1959 that established the power for the Director to enter into a deed also established a formal register of third party interests in quota units under a deed. Any registered third party interest was maintained even if the quota units were transferred to another party. The increased security for quota holders, and their third parties, has been at a cost in terms of the flexibility of possible management arrangements due to the wording of the abalone Deed of Agreement. For example, the deed is written in terms of a single fishery covering all abalone of the genus Haliotis. Thus, any moves to zone the fishery either in terms of area or species becomes very difficult. Complex solutions are required because more straight forward options are excluded by the deed. For example, the greenlip abalone fishery has to be managed as a part of the overall abalone fishery, with the total allowable catch for this fishery of 140t for the year 2000, being divided equally between the 3500 abalone quota units. Thus, each quota unit has 40 kg of greenlip abalone as part of its allocation in 2000. The alterative of separating-off the greenlip abalone fishery and allocating it to those quota holders with some history was not available due to the wording of the deed. For the introduction of the individual quota system, the main policy objective was to limit the overall catch of abalone. The secondary objectives were to provide equal access to the fishery for all participants and provide the industry with an opportunity to plan their future diving operations. The main objective in the separation of the diving authority from the quota units was to allow investment in the fishery, via ownership of quota units, and to allow young divers to enter the fishery without extremely high debt loads. The secondary objective was to reflect changes that were already occurring within the commercial fishery. In both cases, the allocation method was determined through consultation with participants in the commercial fishery. For the introduction of the individual quota system, the commercial abalone industry held a strong view that while individuals may have had different catch histories, they all had the same access rights. For the allocation of quota units, the Department and the industry agreed that it was for the industry participants to agree on the individual allocations, rather than for the Government to be making decisions about the status of competing claims. For the introduction of the individual quota system, the allocation method used was for each holder of a commercial abalone licence to receive an equal share of the total allowable catch. The exception was for the five Furneaux divers who received only 20 abalone quota units against the 28 quota units for each of the other 120 divers. The reasons behind this difference were the restricted area and the lower catch available in the area offered to these divers. The allocation method for the separation of the authority to dive from the holding of abalone quota units was through the agreement of the current holder of the commercial abalone licence. That is, the Department would only accept claims for quota units where the current holder of the licence agreed. Under the Fisheries Act 1959 there were no appeal provisions, however, as the introduction of the individual quota system was on the basis of an equal share to each diver there was no requirement for appeals. There had been extensive consultation with the commercial industry prior to the introduction, which had given opportunities for individuals to make their particular case to the Minister. With the separation of the quota from the diving authority, the Department had adopted the position that any changes could only occur with the agreement of the current holder, therefore, disputes had to be dealt with outside the Department. The final option was for the parties to take their dispute to the civil courts. The quota system has been successful in limiting the commercial catch of abalone, although it took several years with reductions in the total allowable catch to reach a level of catch that was believed by the Department and industry to be sustainable. The fact that two subsequent increases in the total allowable catch could be introduced, indicate that the abalone resources were in a healthy state because the quota system had been able to limit the commercial catch. The secondary objectives appear to have also been met. In the separation of the diving and quota parts of the licence, the principal objective of allowing access of investment in abalone fishery has been achieved. This is indicated by the increase in the value of an abalone quota unit from $A30 000 in 1991 (when a unit was equal to 600kg of abalone and the beach price was $A22/kg) to $A280 000 at the beginning of 2000 (when a unit equalled 780kg of abalone and the beach price was $A 40/kg). The participants in the commercial abalone fishery have gained from the various changes in the nature of their property rights, through a stable fishery over the past twelve years following an initial few years to adjust the total allowable catch. They have also gained through the significant increase in the value of abalone quota units. Members of the industry, either through the industry association, the Tasmanian Abalone Council, or individually have a strong commitment to the quota system. Many groups have expressed concern at the rights of the commercial abalone fishery, mainly dealing with the large incomes coming to quota-unit holders, compared to the poor return coming to the community via the Government. Most comments have occurred when the total allowable catch has been increased (at the end of 1996 and 1999). The main areas where improvements could have occurred are in the nature of the Deed of Agreement. The deed has a limiting effect on the management arrangements that can be introduced without overwhelming, if not unanimous, agreement from holders of rights under deeds. It would have been an improvement if the deed had allowed for flexibility in management arrangements without reducing the rights of the holders. The Deed was also introduced to allow for a reasonable recovery of a share of the resource rent available in the commercial abalone fishery, however, the inflexible nature of the deed has meant that large proportions of the resource rent, as indicated in the significant increase in the value of abalone quota units, have gone to the abalone quota unit holders, with little passing to the community through fees to the Government. Anon. 1993. Restructuring of the Tasmanian Rock Lobster Fishery. Unpublished report Rock Lobster Working Group - Department of Primary Industry and Fisheries, Tasmania. CREA - Centre for Regional Economic Analysis 1997. An economic analysis of the Tasmanian Fishing Industry. Report prepared for the Fisheries Research Development Corporation - Project 95/159. DPI - Department of Primary Industry 1990. Options for Amending the System of Licensing Commercial Abalone Divers: A Report from the Ministerial Working Group into Tasmanian Abalone Licensing; Department of Primary Industry, Hobart. DPIF - Department of Primary Industry and Fisheries 1998. Review of the Tasmanian Abalone Fishery Management Plan: the Greenlip Abalone Fishery around the Furneaux Group and the Rest of Tasmania, and Some Minor Clarifications; DPIF, Hobart. Ford, W. 2000. Will improving access rights lead to better management - Quota management in the Tasmanian rock lobster fishery. In: Shotton, R. (ed.) Use of property rights in fisheries management. Proceedings of the FishRights99 Conference, Fremantle, Western Australia, November 1999, Workshop presentations. FAO Fish. Tech. Pap. 404/2 pp 289-295. Gardner, C. 1999. Tasmania rock lobster fishery 1998/99 - Fishery Assessment Report, Unpublished report, Tasmanian Aquaculture and Fisheries Institute, University of Tasmania. Hansard 1997. Legislative Council Hansard, Tasmanian Parliament, 19 November 1997, Parts 1-2 pp 1-107. Harrison, A.J. 1986a. The Development of Existing Rules in the Tasmanian Rock Lobster Fishery. In:Tasmanian Rock Lobster Seminar 1986 (Ed.) Bear, S. Department of Sea Fisheries Technical Report 25. pp 7-10. Harrison, A.J. 1986b. Gastropod Fisheries of the Pacific with Particular References to Australian Abalone, In: Jamieson G.S. and Bourne, N. (Eds), North Pacific Workshop on Stock Assessment and Management of Invertebrates; Canadian Special Publication of Fisheries and Aquatic Sciences 92. pp 14-22. Harrison, A.J. 1983. The Tasmanian Abalone Fishery; Tasmanian Fisheries Research No. 26; Tasmanian Fisheries Development Authority. Jones, R. 1971. Rocky Cape and the problem of the Tasmanians; PhD Thesis, University of Sydney, NSW. Living Marine Resources Management Act 1995. Statute 25 of 1995, Parliament of Tasmania. McNee, A. 1993a. Greenlip Abalone: In: Kailola, P.J., Williams, M.J., Stewart, P.C., Reichelt, R.E., McNee, A. and Grieve, C. (Eds.). Australian Fisheries Resources: Bureau of Resource Science, Department of Primary Industry and Energy, and Fisheries Research and Development Corporation, Canberra, pp 78-80. McNee, A. 1993b. Blacklip Abalone: in Eds Kailola, P.J., Williams, M.J., Stewart, P.C., Reichelt, R.E., McNee, A. and Grieve, C. Australian Fisheries Resources: Bureau of Resource Science, Department of Primary Industry and Energy, and Fisheries Research and Development Corporation, Canberra, 81-83pp. Morrow, H.P.R. 1991. An Economic Analysis or the Tasmanian rock lobster Fishery 1990/91. Unpublished report to the Rock Lobster Working Group - Department of Primary Industry and Fisheries, Tasmania. Schulze, P., R Ginn, P. Harriss, D. Parkinson and G. Squibb 1997. Tasmanian Rock Lobster Fishery, Legislative Council Select Committee Report - Parliament of Tasmania. Statute 57 of 1997. Living Marine Resources Management Amendment (Rock Lobster Quota) Act 1997, Parliament of Tasmania. 1 The views expressed in this paper are those of the authors and may not be the views of the current or previous Tasmanian Governments. 2 Demerit points are a system of assigning one point for each $A100 of a penalty fine imposed for a conviction under the Living Marine Resources Management Act 1995 or its subordinate legislation. A licence ceases to have effect if 200 demerit points are assigned in a five year period. Assignment of the points is not at the discretion of the courts or the Minister, but is mandatory.